Tequila 33 Silver is the result of a strict formula and a rigorous process of more than 50 possible recipes. Our 33rd formulation is the best taste of pure Tequila you can get. The hand blown glass carafe represents quality, royalty, and status with its contents. 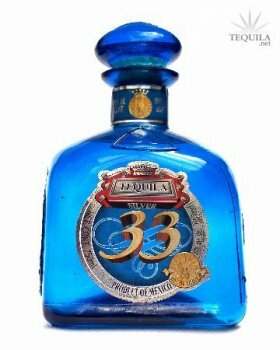 Tequila 33 Blanco offers the purest taste of the Agave Azul Tequilana. I found this tequila last night by accident so I picked it up and tried it at home and it does just fine as a sipping blanco tequila while watching a movie on a rainy/snowy night.It comes wrapped in a nice colored sack/bag and it is housed in a hand blown blue bottle.Upon initial taste it has a medium aroma of earth and a slight pepper scent.It has no oiliness on the tip of your tongue. 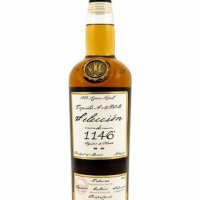 There is a slight and I stress "slight" numbness and "slight" alcohol tinginess but nothing to scare you away from it.The finish is good for a silver tequila with no funky afterness and/or burning.this is a good blanco to try and enjoy in my book.